By Kathy Shea Mormino on April 7, 2013 Visit Kathy's Website. This is Rachel. If you haven’t already made her acquaintance, she’s something of a hen icon on my Facebook page where she appears daily in all her puffy cuteness. Rachel is a Bantam Cochin Frizzle. Cochin is her breed, bantam describes her miniature size and frizzle describes her unusual feathers. Frizzles are the divas of the chicken world. The term frizzle refers to a gene that produces funky feathering. 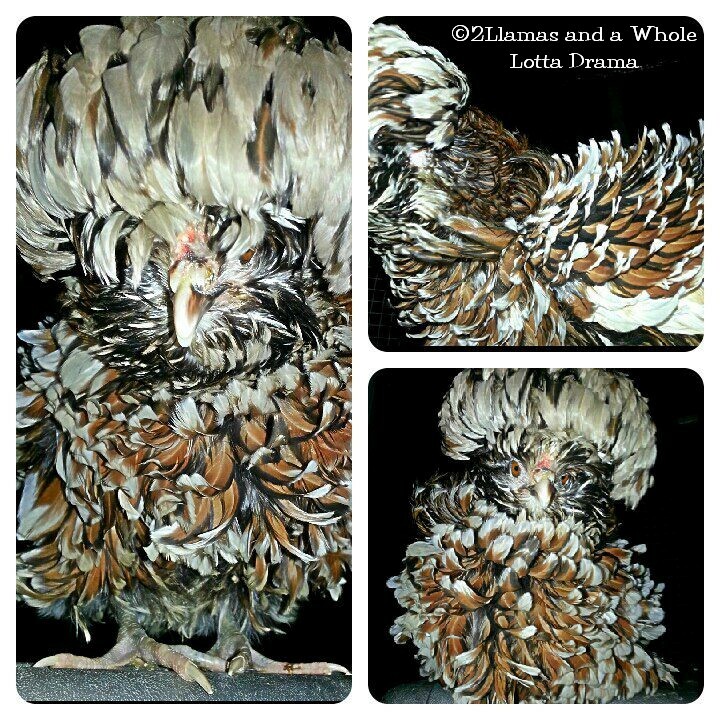 Rihanna, a Tolblunt Crested Polish Frizzle belonging to Kristin of 2Llamas and a Whole Lotta Drama. This is a White Cochin (large fowl, not bantam) and a relative of Phoebe’s, above. · Any breed can be bred to created frizzled chickens. · Frizzled feathers curl out and away from the skin instead of laying flat against the skin. · Frizzles cannot fly and may find it difficult to roost if the roosts are positioned too high above the floor. · Frizzled feathers provide less protection from the cold than normal feathers as it is difficult to trap warm air against their bodies with backwards-facing feathers. · Frizzled genes are dominant. A smooth-feathered bird bred to a frizzled bird will result in 25% of the chicks possessing frizzled feathers. For a in-depth discussion of frizzled genetics, visit the Polish Breeders Club. Frizzles and Sizzles… oh MY! They are all adorable! Thanks for the giveaway! Frizzles are simply irrestible! Frizzlestible! Hi, I love your site! I’m new to chickens (we’re moving in a few days, building a coop and getting layers), but I’ve been reading your blog since we decided we might want chickens. It’s so helpful and informative and the giveaways are great! Love all the tips! I don’t see an entry form either. I have frizzles and sizzles and I don’t find any great problem when they breed together,or frizzle to frizzle you just get a weird mix of feathering, but nothing that affects health. Mine are also great layers of brown eggs, although the eggs are small and they sit well, even in the winter. My roosters have always been good with hens, although not with each other. Put me in for the drawing on the feed please! And that little chicken is darling! Although I love Rachel and the look of the frizzled birds, I don’t think I should get one unless I plan on entering a “Who looks most like their chicken” contest because of my own natural frizzle hair! LOL I do love to see Rachel daily, tho! Thank you for posting info on this crazy breed! I want one now! I don’t see an entry form above but I’ve been following you on FB for awhile now and I would love to win some chicken feed! I will be getting Silkies and a Polish soon and would like to try this! Love your blog and considering getting a frizzle. I didnt know they couldn’t fly. Great article and you make it fun and interesting to read. Thanks! Never had a frizzle but just hatched out my first Silkies, It’s a start. Great article with one small exception. Frizzled Silkies are NOT the same thing as Sizzles. Frizzled Silkies have the same fur-like feathers as Silkies except they are curled backwards. Sizzles have harder feathering more like the Cochin & they also come in a smooth & a frizzled variety. I raise all 4 types & they are adorable. Wish I could post some pictures. Ordered some frizzle cochin bantams will be here in May. Already have the smooth feathered ones. Can’t wait for them to show up as I did a test run with my incubator and they are sooo cute. Unable to find the entry form:( Liked on Facebook twice and NOTHING? AND..ANYONE having any frizzles for sale or eggs, please get in touch with me. Lost mine..(3) to a bad accident. I have black and white Frizzles females and roos. I have put my white frizzle hen in with a gorgeous white banty cochin roo who is much less dominating than the frizzle roo. I have put the frizzle roo in with the my plain white banty cochin hens and they are doing great. I have my black Mr. Frizzle who is our first in with a variety of hens. He seems pretty happy. We love our silkies and frizzles and I love the mix of the two them. I didn’t see any entry form available. I would love a Frizzle! Thanks for the facts! I think My silkies and frizzles are my favorite birds that I own. I don’t have any Frizzles yet but would LOVE to get at least one someday! I would love a sizzle. Awesome bird. I have a mixed Blue Laced Red Wyandotte that is a frizzle. Some of my pure blr wyandotte have kind of a frizzle look to them. Precious babies – they are so pretty…always looks like they are going to the ball……. I am THRILLED that my Frizzle Roo has been breeding our W.C.B. Polish hens!! As well as the Buff Orp & B.C. Maran hens. He hasn’t bred our little black Silkie hen; she likes the Self Blue D’Uccle =) With all these chicks hopefully coming we could really use the Nutrena Chicken Feed! Thanks for your wonderful blog posts!